Calculating the Return on Investment of every aspect of your company’s marketing strategy is an important part of ensuring that money is being spent in the right places to improve the reach of your brand without costing a fortune. Unfortunately some aspects can be difficult to keep track of without specialized systems. The name and address of the caller. This information is useful in calculating the cost per call for regional advertising and to help identify the characteristics of callers but did not provide concrete ROI information for online strategies. Thanks to new advancements, the integrated call tracking built in to AdLuge can now be used in order to see the progress of potential leads through your online sales funnel right up to the moment when they pick up the phone and call you. Website visitors are provided with a unique number to call which is automatically routed to your main business line and this allows leads to be connected with your website data to discover exactly what they were looking at when they decided to call as well as how they found your website. This information can be extremely valuable in calculating not only the cost-per call or cost-per conversion but the cost per lead, a much more useful statistic in determining the exact return on investment of your online marketing campaign. This information can also be highly useful is establishing which pages or specific content pulls in the most potential customers and which offers are most effective in the long run allowing for adjustment of your strategies where necessary. Are the How-To guides on your blog your number one draw? Consider making a How-To Section and constantly increasing your stores of this type of content. Or maybe you get most of your customers through free trials. Whatever strategy is working for you, this information can help you focus your time and investments where they are most effective. In-depth call tracking can take this a step further even and provide data on repeat business and each lead’s activity in order to determine your cost per profit dollar. This can be an important factor for business’ with high overhead costs such as investments in expensive equipment. By keeping track of repeat business it becomes easier to ensure those investments are providing good ROI as well. It is important to remember that ROI is not a perfect metric as it can mask the actual amount of revenue and encourage business owners to believe that they can scale up their activities and expect the same ROI which is often not the case. Costs do not scale perfectly with success and neither does return on investment but this does not make it an unimportant consideration. 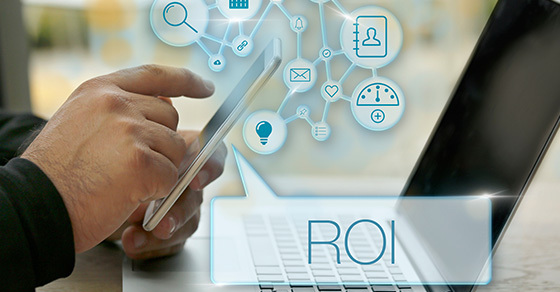 ROI should be seen as a helpful tool in determining where your business should invest its resources and not as an ultimate measurement of success.